[07/06/2018 @ 11:14 AM] Fare gone. Removing from deal list. 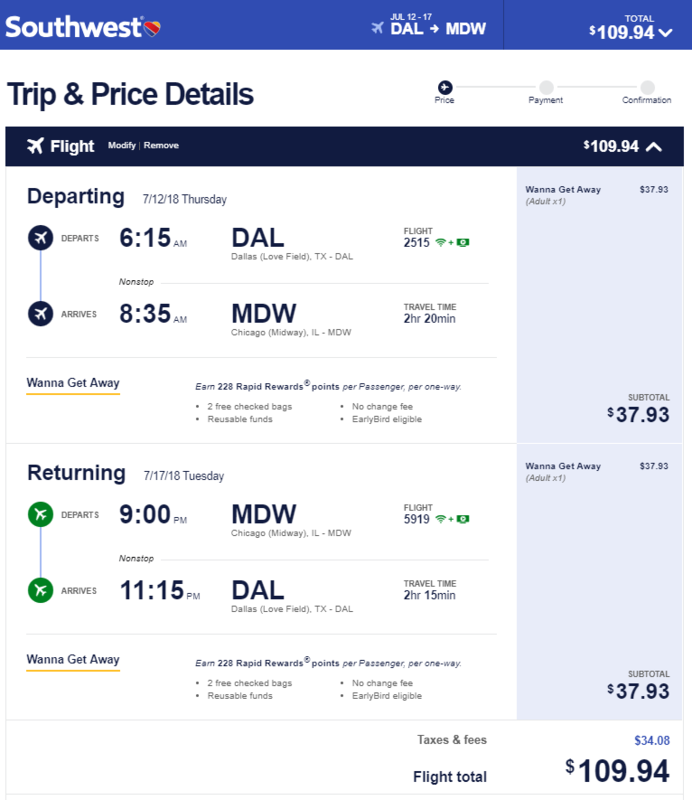 Southwest has round-trip flights from Dallas (DAL) to Chicago or Atlanta (MDW/ATL) starting at $104, NONSTOP. $52 each-way. Chicago flights from August to March. Atlanta flights from August to November. Weekends available. Origin/Destination reversible. Note: Christmas / New Years is available for Chicago. Note: You can save an additional $50-$150 if you book your Flight+Hotel together as a package on Southwest Vacations, and use either the PLANSAVE or FREEDOM coupon-codes. Coupons expire on 07/09/18. Before you commit, always compare the prices of the individual Flights and Hotel with other hotel booking sites like Tripadvisor. Chicago – Example Dates: (Southwest / BookingBuddy) Jul 12 – Jul 17 / etc… / Dec 24 – Dec 29 / Dec 30 – Jan 03 / Mar 01 – Mar 03 / Other dates: Use the Fare Calendar on Southwest. There are more dates available than the ones we list here, experiment on your own. Atlanta – Example Dates: (Southwest / BookingBuddy) Jul 06 – Jul 10 / etc… / Nov 09 – Nov 12 / Other dates: Use the Fare Calendar on Southwest. There are more dates available than the ones we list here, experiment on your own. I was able to pull this fare up on Southwest. Screenshot taken at 6:06 PM on 07/03/18.